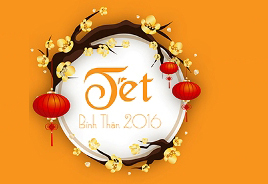 To meet the needs of market transactions and to fit the regulations of Circular 203/2015/TT-BTC dated 21 December, 2015 providing the guidelines to the transactions on the securities market, Hochiminh Stock Exchange (HOSE) and Hanoi Stock Exchange (HNX) will apply new trading regulations since September 12th 2016. 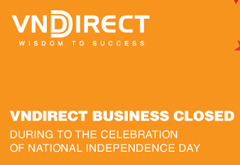 Due to celebration of this year’s National Day, VNDIRECT’s security trading service will be closed on Friday, 02 September 2016. We will resume our business on Monday, 05 September 2016. 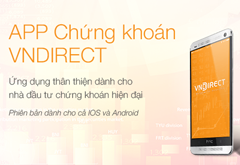 With the keyword “VNDIRECT”, investors can easily find this mobile app and download it free on the App Store (iOS) and Google Play (Android). 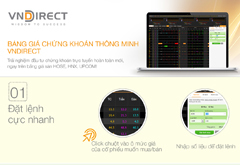 From December 1, 2015, VNDIRECT has launched the new version of Price Board at https://banggia.vndirect.com.vn/v3/ to provide a totally different experience for customers.